I like to think of myself as a good citizen and get great satisfaction from doing a good deed. I once saw a helpless, heavily pregnant woman, battling with her screaming toddler, who refused to sit in his car seat, across the car park at the supermarket. I marched straight over and offered to strap him in. She was so grateful and her son was so taken aback, that a stranger was doing up his straps, that he immediately was silenced and sat like an angel! I knew that even if I hadn't helped that struggling mother that day, that she would have fought with her toddler, until he was safely in his seat. That is why I was completely gobsmacked, to the point of furious anger this afternoon, when I saw a mother driving her child along the dual carriage way unstrapped. I did a double take when I pulled up alongside the car, when I saw the (could only be) 4 year old bouncing around, holding the headrest of her mother's seat. I assumed for a moment, that perhaps she hadn't realised her child was free from her carseat and maybe had the radio on loudly. She didn't deserve my benefit of the doubt, as when I signalled to her to get her attention, and did an action, gesturing to her daughter and my own seat belt, she promptly looked the other way, and drove off as the lights turned green! I was horrified. Why bother spending a lot of money on a fancy car seat, if you have no intention of using it? I caught up with her at the next set of lights and beeped this time. Big boy asked me why I was cross and I said "that naughty Mummy hasn't done her little girl's straps up" to which he replied "the Police will tell her off and come and get her". This is what we said, when he once tried to wriggle out of his seat on the motorway. I am very glad it hit home. Children have no idea how dangerous it is, to sit freely in the back seats. But grown ups do. We have all seen that shocking advert on the television, where the teenager in the back, hits his mother's seat and jolts back with cuts and bruises but the driver is shown lifeless. That woman today was the most arrogant, shamelessly irresponsible, person I have ever seen. Maybe I am being too forthright, that I was a nosey parker signalling to her, that her daughter was in danger. I don't think so. I was boiling with anger by the time I got home. Why do these people (as I've seen more than just this one child unstrapped driving about) think it is acceptable to leave their children in a potentially fatal scenario? I am almost tempted to tweet her numberplate, in the hope that someone would know her and shame her into realising how stupid she is, to let her daughter and herself, be put in an unnecessary, dangerous position. How long does it take to do up a seat belt? Less time than it takes to have a car accident and never get the chance to turn back the clock. 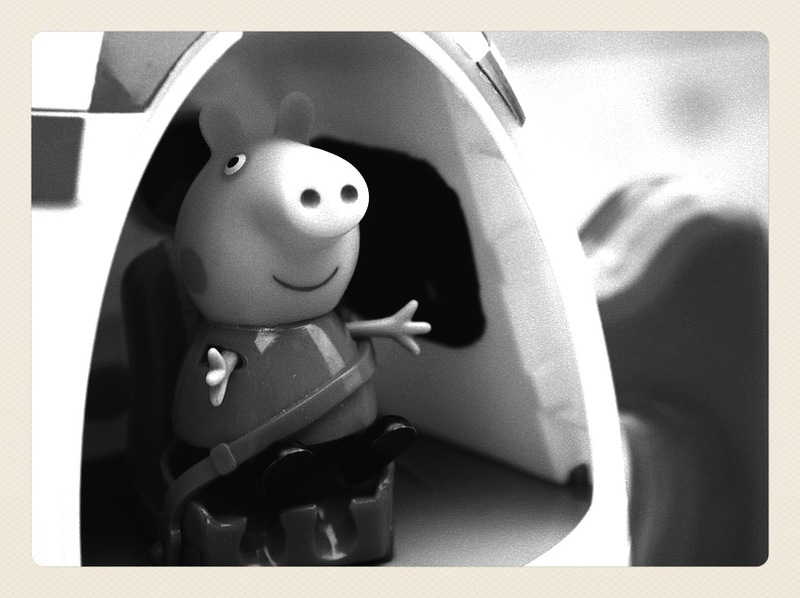 Even big boy's Peppa rocket has seat belts. Basic safety. Shame on her.